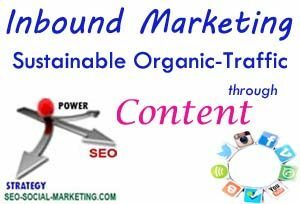 Inbound Marketing-Sustainable Organic Traffic (IMSOT) is a new term to replace on-page and off-page optimization and to increase organic traffic to your website. Inbound Marketing, IM, entails the use of blogs, social media, video, SEO, newsletters, podcasts, whitepapers, and other forms of content marketing to promote a website. It is the mean to endorse a website through relevant links from external sources into your targeted website. The best way to use inbound marketing is to map out a strategy on how your external links will increase traffic to either a particular landing page or the website as a whole. Inbound marketing is the new organic style of increasing customer’s attention to a webpage. May your website be informative or an e-commerce site, you have a variety of resources in hand to increase traffic to any part of a webpage! One of the essential points to draw attention is providing customer feedback. Once a customer interacts with your website, you must create trustworthy relationships. You can use a simple feedback form that will entail customer name, phone number, email, description, live chat, or any vital point, which your programmer can easily tweak. With inbound marketing strategy you create sustainable organic traffic. Content is the driving force of your sustainable organic traffic. In other words IM builds sustainable organic traffic for your website. As you use the many different forms of content marketing to manage blogs, videos, SEO, social media, newsletters, whitepapers, podcasts, and any other platform that fits your industry, you promote your website and with that you created sustainable organic traffic. In some industries, companies use automatic callback system, which is free to the client. Your IM will generate leads that will end up in a sale. The process of using IM is more than just tweaking your pages, installing a form, and waiting for a client to contact you. In order to become successful, companies must educate and train their staff to execute and communicate with clients on different platforms. Your website content pulls customers into the site and your staff does the rest.